Cricket is a tough game, especially when played on foreign turf. Every team, every player and every coach tries to do well in an away series because they know that it is the demanding away victory that counts over the simple home win. The Indian subcontinent, with its turning tracks, has always been a malady for the Australians, who are used to pace and bounce. In spite of that, some batsmen from Down Under have managed to make their mark in the Indian editions of the Border-Gavaskar trophy. They created an impact from the word go and did not quiver under pressure from their surroundings. While Steve Waugh could never achieve his ‘Final Frontier’ of winning a series in India, he definitely won as a batsman. The only feather missing from the Australian’s cap is not a World Cup trophy, but a series win in India. One can understand his predicament, though – his team was up against arguably the best test team India has ever produced. He did come close in 2001, though. After having won the first Test of the series, Waugh scored 110 in the first innings of the Kolkata Test to propel his team to a dominant score of 445 and enforced a follow-on soon. Everyone knows what happened after that. VVS Laxman and Rahul Dravid took stance and batted through an entire day. Harbhajan Singh took 13 wickets to bring the Indians home. While marvelling over this spectacular win, cricketing experts and fans alike forgot to applaud Waugh’s sturdy century of the first innings. The Australian captain played well in the Chennai Test too. With a pair of 47s, he tried to stamp his authority on the match. He was given out for handling the ball in the first innings which was one of the biggest talking points of the series. With India having lost 8 wickets while chasing 155, Australia came tantalisingly close to clinching Waugh’s coveted dream. However, a nail-biting chase from the Indians ensured that the home team took the series 2-1. The biggest plaudit that Waugh, the batsman, deserves is that he managed to turn the tables after his disastrous tour of India in 1986. He had managed to accumulate just 59 runs in three matches then. 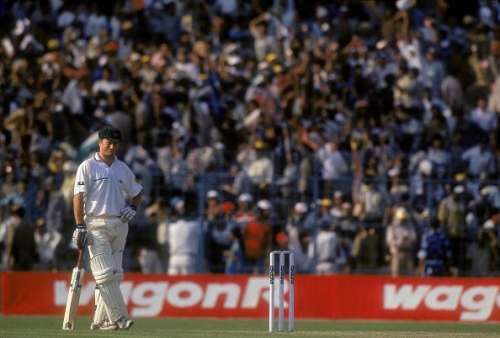 He improved with an unbeaten 67 in the 1996 lone Test in Delhi and backed it up with a solid 80 in the 1998 series. His improved slog sweep assisted him in handling spin and with players like Warne and McGrath besides him, his confidence peaked. He came into his own in 2001 and scored 243 runs at a reliable average of 48.